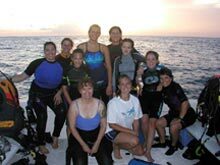 The 2004 Aquarius Project Team completes a day of SCUBA diving in the waters of the Florida Keys. Click image for larger view and image credit. Caroline, Girl Scouts of the Gulf Coast of Florida, Inc. The Aquarius Project is an intensive week of ocean science and discovery for a nationally selected group of six Girl Scouts sponsored by the National Oceanic and Atmospheric Administration and the Girl Scouts of the USA. The event centers around the National Undersea Research Center's (University of North Carolina at Wilmington) Key Largo, Florida field station, home to the world's only underwater laboratory - the Aquarius Habitat. Girl Scouts are housed at the MarineLab Environmental Education Center, also in Key Largo, and attend lectures and field sessions with educators and other ocean science mentors. Girl Scouts learn the fundamentals of ocean exploration, coral reef and mangrove ecology, maritime archaeology, habitat preservation, and marine biology. Weather permitting, lectures and field work include a SCUBA dive to the Aquarius to visit current mission scientists at work in the habitat; working alongside marine resource scientists on the coral reefs; SCUBA diving to numerous sites, including a shipwreck site in the Florida Keys. In the Aquarius Project, girls learn about ocean science by hands-on experience and interaction with mentor scientists. Each participating Girl Scout devises an outreach plan for taking what they learned home to their schools, Girl Scout councils and communities. between 14-18 at the time of the event. This event is sponsored by the National Oceanic and Atmospheric Administrations Office of Ocean Exploration. There is NO event fee. Travel costs are fully funded. Any ancillary travel costs, such as taxi fares, will be reimbursed to the participant after the event. Each participant is required to bring all necessary diving gear with her to the event (excluding tanks and weight belts). Please contact the GSUSAs Elliott Wildlife Values Project Consultant, Jodi Stewart or call 1-800-223-0624 Ext. 8076. Information is also available on the GSUSA's Destinations and EPA web sites.